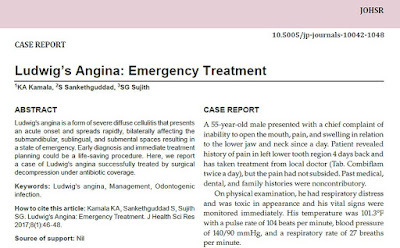 Ludwig’s angina is a rapidly progressive, potentially fulminant cellulitis involving the sublingual, submental, and submandibular spaces. It may or may not involve parapharyngeal space. The word Angina is derived from the Latin word angere which means to strangle. Ludwig’s angina was coined after the German physician, Wilhelm Friedrich von Ludwig, who first described this condition in 1836 as a rapidly and frequently fatal progressive gangrenous cellulitis and edema of the soft tissues of the neck and floor of the mouth. Other synonyms include angina ludovici, cynanche, carbuculus gangraenosus, morbus strangulatorius and angina maligna. Despite the recent advances in therapy, rare and potentially life-threatening complications may still arise from time to time, and, as a result, account for significant morbidity and mortality. 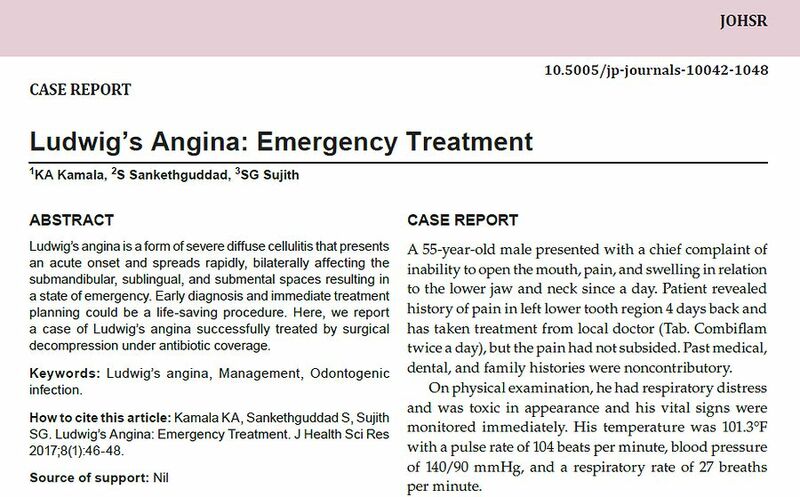 We present a case of Ludwig’s angina, successfully managed at our hospital, with a brief review.